You gotta start somewhere right? I’m a huge fan of wartime replica packs. 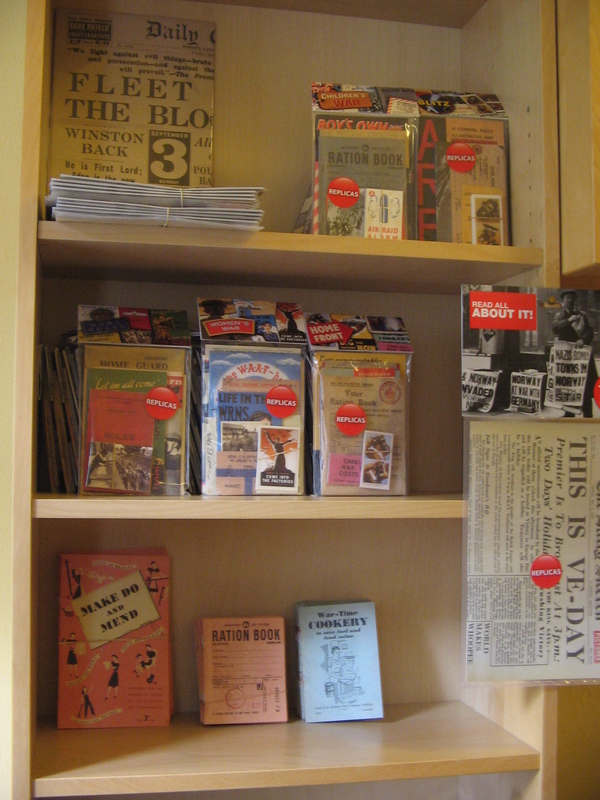 I use the packs (which contain authentic replicas of all sorts of cards, booklets, pamphlets, postcards, ration books etc) to not only educate myself more about wartime Britain (especially the home front and the role of women) but to decorate my home. I’ve taken a step forward and purchased some of my favourite packs to sell on-line from my blog and I’m also looking into a small selection of other items too for other’s who are interested in the domestic home front. My dream is to do some cooking demo’s, share ration book food and sell my favourite educational bits and pieces (and hopefully some recipe books) at 1940’s or nostalgia type fairs in 2014. This entry was posted in Uncategorized and tagged 1940s shop, memory packs, mempacks, ration books for sale, wartime recipe books, wartime replica packs. Bookmark the permalink. Can’t wait! Still longing for you to write a book based on your blog. Not sure who said it but ‘do what you love and you’ll never work a day in your life’. Here’s irony for you – will you ship to Canada?! Oh yes no probs- I would have to work out the P & P to Canada for you depending on what you ordered and then let you know..
Atta girl. Go for it. Admire your courage in the face of great adversity. Any chance of more photos of that lovely little area you have cleared in the garden for your veggie plot? I t really appeals to me. What a good idea. 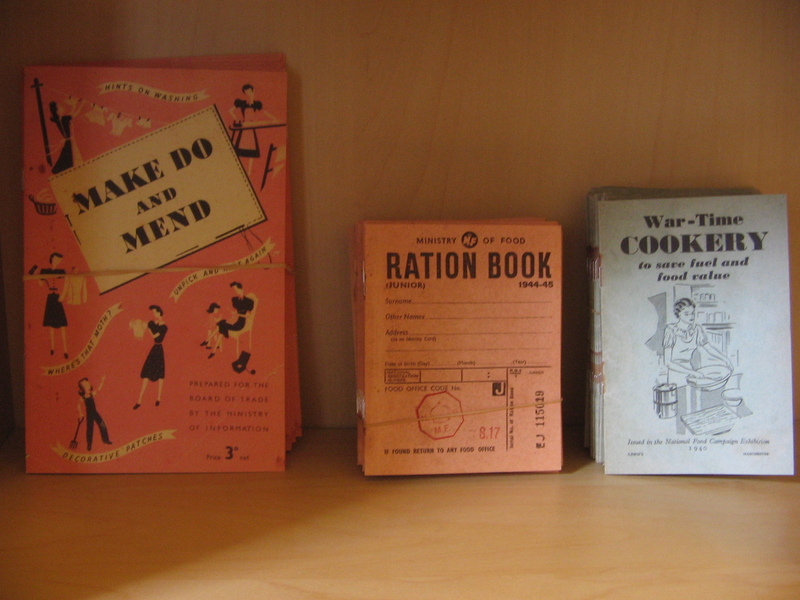 I bought one of these – the rationing kit – when I visited the British Army Museum in Edinburgh. It contained an excellent recipe book, ration book, and a variety of interesting and practical information that I rely on to this day. Brilliant idea. There’s been an explosion in vintage fairs since you’ve been away but the only food contributions seem to be those oh so (not) vintage cupcakes. Your info (and a few slices of cake…!) would go down a storm. I can see a real use for this stuff, especially the “make do and mend”. I have a copy of a book of collected laflets which came out a while ago and have found it useful for adjusting my wardrobe as I (hopefully) lose weight. So many women were never taught the gentle art of fixing stuff. Awesome idea- I hope you do really well with it and find an exciting new venture after your move! Will you post to New Zealand? There’s loads you get involved in. I have a photo in my camera of a war-time tearoom that was in a marquee at the Royal International Airshow at RAF Fairford this summer. I’ll send it you. There definitely is interest in your field of expertise and now is the right time to make the most of it. That tea room was amazing!!! I visited many times over the course of the weekend. Brilliant feel to it. I chatted to the owner for a while in a very rare quiet moment one morning. It is a pop up stand that they do only at fairs etc… They are looking to go in to permanent premises as well at some point. They’ve even been asked to take it on a tour of the US! Fantastic! Love your blog- I’d be interested in something from the shop- looking forward to seeing it! Excellent! 🙂 I look forward to it!